Having seen Liz’s parents off at the airport yesterday after a lovely few days together, we thought we would take the cheaper option of getting back to the marina. So we took the train to Cadiz only to find that we had missed the last ferry to Rota. We then took a ferry to Puerto de Santa Maria so we could jump in a taxi. Easier said than done but after an hour we found one and then got back to Nimrod. The whole thing cost us cents less than the taxi fare from the airport and several hours of our lives. 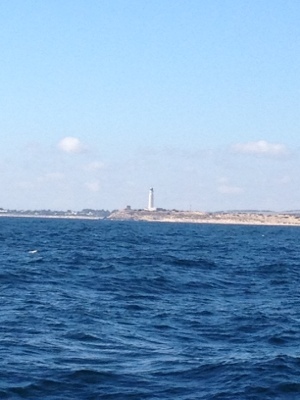 Today, we sailed to Barbate which is halfway between Cadiz Bay and Gibraltar. It is a completely soulless place with the only people in the marina transients like us. However, given that there is nowhere to anchor, it will do for the night although still no wifi. We started the day with plenty of wind but unusually it died after lunch so we ended up motor sailing for the last few hours before we entered Barbate. We did manage to round the last big headland, Cape Trafalgar, before the Straits of Gibraltar and even managed to watch Murray win gold in the tennis as we did so on the boat TV. Tomorrow we need to make Gibraltar as the wind turns on Tuesday to an easterly which would make for a very unpleasant sail through the Straits. 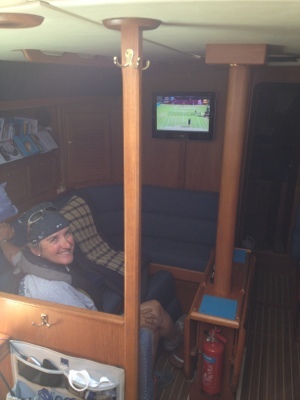 Pictures below of Jo watching the tennis and also of Cape Trafalgar, evocative of Nelson’s great victory at the battle of Trafalgar in 1805. 1 Response to Nearly there!